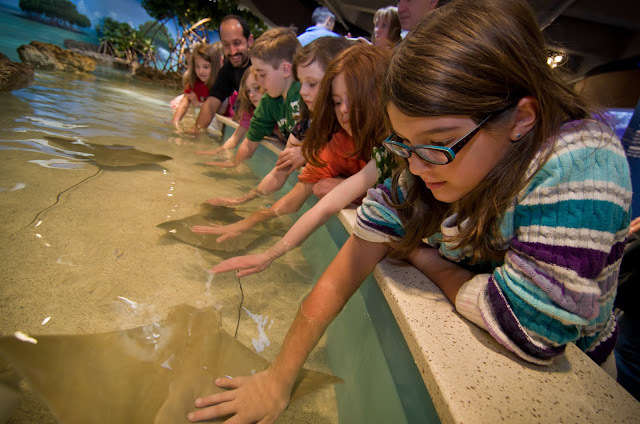 One of our most beautiful animals in The Trust Family Foundation Shark Ray Touch Tank is also one of our most elusive. The leopard whiptail ray (Himantura undulata) has an intricate skin pattern that certainly does call to mind its namesake, the leopard. 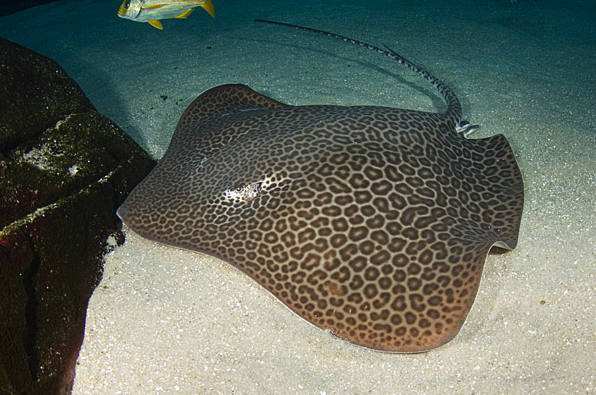 Leopard whiptail stingrays can grow to about 1.4 m wide. As with other whiptail rays, their tail is very long compared to their body and the animal's total length can be upwards of 4 m. These rays are found naturally in the Indo-Pacific region from the Bay of Bengal to Northern Australia. These rays have a varied diet, but are thought to eat mainly mollusks and crustaceans. Like other rays they use their strong jaw to crush the shells of these animals to get to the soft animal inside. 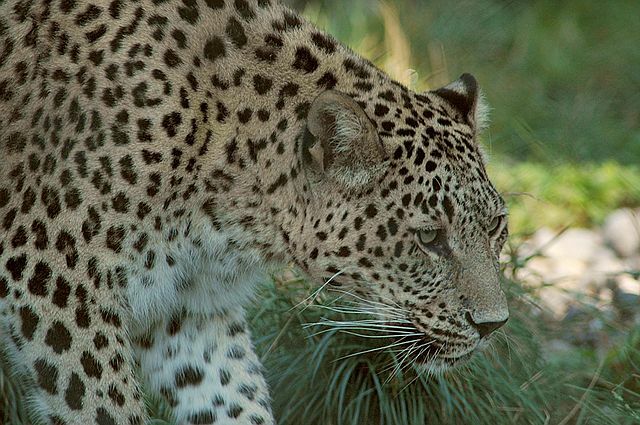 When you visit the tank it may be hard to see this animal right away. However, if you're patient and look towards the back of the tank, you may be lucky enough to "spot" this gorgeous animal. I don't know of anyone getting to touch this shy animal yet, but you never know. If you do get super lucky and have the opportunity to interact with this animal, be sure to come back here and comment about your experience! Just be prepared for jealous comments from educators! Actually the aquarium in Philadelphia, PA has one of these beauties in the interacting tank. This one kept by me, wanting to be petted/ giving food perhaps for almost 20 minutes! I am so in love with him. They are gorgeous and this one was so friendly. I got to touch him! My partner and I had an amazing time, over an hour, at the Touch Tank. With the Giant Ocean Tank closed, I wanted to dazzle my partner, afiest time visitor. We spent over an hour at the best exhibit ever. NOt only were the usually friendly cow nose rays up front, but after 45 minutes of only we two, a staff member and scant few other people, the smaller female Leopard Whiptail came to say hello, the to our (and the staff's amazement) the huge male! We felt like rockstars! It was even the staffmember's first touch on the big guy! We even got to touch the black Yellow Ray, and (gasp), the Epaulette Shark. I'm buying a membership ASAP! Wow! That definitely sounds like a remarkable and memorable experience. So glad that you were able to meet these beauties, and thrilled that you'll be joining us more often as a member!